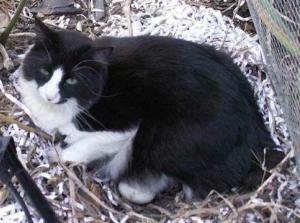 September is National Animal Preparedness Month. Some natural disasters require that you evacuate your entire family, pets included. Wildfires, floods, hurricanes, even tornadoes are all times you may need to evacuate your entire household. The most important thing you can do for your family is prepare them ahead of time, and this includes dogs, cats, horses and poultry. There are some important things you should consider when thinking about an evacuation situation. It’s not a one-size fits all scenario. Every household and location will be different. That’s why it is so important for us all to work on this for ourselves. First: What things is your area at risk for? Here in Arizona our largest dangers are wildfires and floods. The definition of a “disaster” can change depending on where you live. For example, the Haboobs, or dust storms we experience during the summer monsoon, if they came up in Columbus, Ohio would have the populace feel as though they were experiencing the apocalypse. If Ohio’s winter storms happened here, the desert areas would come to a standstill for the same reason. This is why it’s important to know what disasters your area is prone to, as it changes your plan. Every summer we see haboobs like this. I was able to take a great disaster planning class, put on by the University of Pittsburgh through Coursera.org. The local Red Cross and other disaster response agencies may have classes. Also contact your local city, county or state offices, as they all have disaster planning arms and may hold classes for the general populace. Just like the fire safety talks you attended back in grade school no doubt told you, you need a plan! Evacuation routes and alternates, food and water, places to stay outside the evacuation area (for instance having a friend in a city several hours away that can accommodate you), etc. Having this planned out ahead of time will keep you from wasting valuable time during an evacuation. It also allows you to practice traveling your routes. A route will do you no good if it’s closed half the year, your car or horse trailer can’t make it through, or if that area is likely to be flooded. Template made by Smartdraw You may even be able to use this to create your plan! The “Go Bag” (aka “Bug Out Bag”, “BOB”, or “72 Hour Kit”) is one of the best ways to ensure you will have what you need when you are required to evacuate in a hurry. You should have one of these for each family member, including pets. I will provide a very general overview here as further articles will cover this in depth. You should first have a file with copies of important documents – home deed, insurance paperwork, animal registrations, marriage certificates, etc. You can even scan or put in a copy of cherished family pictures, or put on a list to grab the family photo albums. While not generally mentioned, it is important to have a RECENT picture (especially important for children, teens and young animals whose looks will change over time) of each family member. This can make the difference between life and death. One thing my family did with our “permanent file” is burn it to a DVD and have a copy in our safe deposit box, as well as a copy with a couple of trusted friends and family members in other parts of town and other states. That way if your area of town is destroyed or you can’t grab your file, at least there is a way to get to the information, whether what you need at the time can be emailed or sent through the USPS priority, at least you have a chance to get such vital information. Covering your bases is incredibly important. Something to keep you occupied – travel game, soduku puzzles, handheld games (with extra batteries). This is not a comprehensive list by any means. We will cover this in more detail in later articles, but please, check out the FEMA website or google to get started. This is very important, and getting started right away is your best bet to keeping your family safe. I know it seems like a lot, but you can buy 72 hour kits online (we’ll cover this more later also) that fit in a backpack or 5 gallon bucket. The food, water, records and means of containing or controlling your pet are the most important parts of this whole list. I say water because many animals will not drink “strange” water in a stressful situation. Some horse owners put Electrolyte Powders, Tang or Gatorade into their horse’s water in small amounts to change the flavor, so that they can do so anywhere and their horse is more likely to drink – check with your veterinarian for advice on that and for dogs and cats. Photo courtesy of Easy Keeper Farm – the tree fell on a barn and had to be cleared away so the horses could access their water after a microburst took down over 400ft of fence and several trees. The first part of practicing your evacuation plan is making sure you can get to your important files, get your animals loaded, and get out of the area as quickly as possible. That means having a file ready to go, having a “72 hour kit” for each family member – including pets, and being able to catch and load your animals easily. When the fire department knocks on your door and tells you to evacuate, they will usually only give you 5-15 minutes to get out. 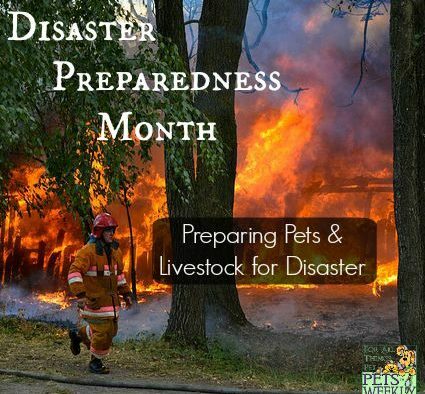 If you’re panicking because a fire is coming, you won’t be thinking about everything you need, you will be very stressed and your pets will sense that, and everyone in your neighborhood will be doing the same. The more you have prepared, the more you have practiced, the easier it will be if the time arises that you need to get out. Make sure your horses are easy to handle, halter and lead. Make sure they’ll load into the trailer in a hurry. Have some supplies in your trailer at ALL times – buckets, extra halters, leads and some grooming supplies. If it’s possible have a water tank in your trailer. Also be sure you can get some hay, grain/supplements and any medications in a hurry onto your trailer. In some climates it may be possible to keep some stored on your trailer at all times. Be sure to rotate it often, as you would any other perishable supplies. Be sure your dog is used to car rides, and you can get them in the car easily. You’ll need portable food and water, dishes and a way to get your dog to eat and drink while traveling. Don’t forget poop cleanup bags! Cats are the most difficult pets to handle in an emergency situation. When scared they tend to hide. This is why practicing is most important for them. You need to have a way to get your cat to come any time – whether it’s opening a can of food or the treat jar. Get your cat used to coming to you in some way (clicker training can help here) and going into a crate. Make this a happy exercise. Most cats only go in a crate to go to the v-e-t so they’re not usually happy about this. Keeping your crate around the house as a hiding den for the cat can help a lot, as can showing your cat good and happy things can happen if they go in the crate or the car. Get your cat in the crate, go for a drive around the block, come home and give them some type of treat. This is why practice is SO important. You need to know where the weak points are in your plan, and have time to address them before you get that dreaded phone call or knock at the door that you have to leave now. Do you know where you can stop on your escape route? This can seem overwhelming to start with, or it can feel like you need a bunch of special or expensive items to get started. You don’t. You can use many items you already have in your home – like backpacks from past school years that are still good, your horse trailer, the crate you already take the cat to the vet in, your tornado or hurricane shelter, etc – to get started. There are many pre-assembled kits you can use as a base for your family’s kit. You can go to the dollar store for things like toothbrushes, crossword books, pens, toiletries and the like. You don’t have to spend a lot of money, just some time to keep your family safe. Taking the time to do this when there isn’t an emergency will help your family if there ever is one, and allow you to be able to handle the situation more calmly. So please, take the time now to get started. You don’t want to have to do it all with only 10 minutes to get out or less.